American shad, head. Caught on the Feather River (Star Bend boat launch) on 4 July 2008. Approximately 20 cm TL. Note the mouth, which is much larger than that of a threadfin shad. Photo courtesy of Brian Currier. American shad, habitat. Feather River (Star Bend boat launch), 4 July 2008. Photo courtesy of Brian Currier. American shad are an anadromous fish and only appear infreshwater during their first 2 years of life and when they return to spawn as adults. Their life at sea is poorly understood but their ability to return to their original spawning ground is known to be exceptional. In the fall, mature shad (3-4 years old for males and 4-5 years old for females) return to estuaries where their bodies transition to the fresh water environment. Runs up river to spawn begin with un-ripe males in March and April when water temperatures reach 14°C, and peak in late May and early June when the water is between 17°C and 24°C. By the first week of July most spawning is complete. Spawning occurs in the main channels of the river where the flow is between 31 and 91 cm/s, dissolved oxygen is greater than 5 mg/L, and the water depth is anywhere between 1 and 10 m, but usually under 3 m. Sand or gravel bottoms are preferred but a variety of substrates can be used. Mating happens most often after dark and consists of one or more males pressing up against a female as they swim in a tight circle releasing sperm and eggs. This will happen multiple times until the female has released all of her eggs. Fecundity levels for California rivers have not been recorded but females in New York populations will lay between 116,000 and 468,000 eggs a season with an average of approximately 250,000. Embryos float with the current downstream before hatching 3-12 days later depending on water temperature. An American shad larva is between 6 and 10 mm in length when it hatches and will quickly grow to between 9 and 12 mm when they absorb their yolk sac. At this point it is very important for the young to reach a food rich area because larvae that have not eaten within 2 days of birth have a severely diminished chance of survival. Their diet consists mainly of zooplankton such as mysid shrimp, but young American shad will also eat surface insects and bottom dwelling organisms, like midge larvae, if the opportunity arises. Returning adults can eat the same prey but are so focused on spawning when they reach the river that they often ignore food entirely. Shad will remain freshwater fish until they metamorphose out of their larval stage approximately 4 weeks after hatching. After this transformation they become resistant to salinities up to 20 ppt. 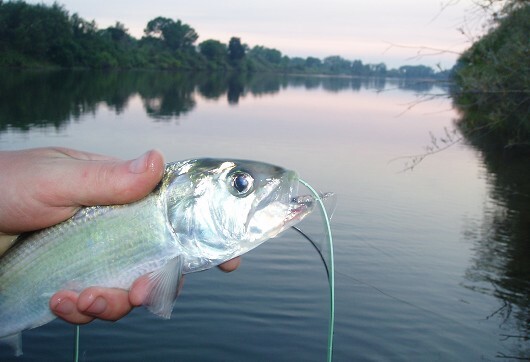 Young American shad usually leave their rivers of birth sometime between September and November but if it is a particularly wet year and overflows are high they may leave as early as June. Some stay in estuaries for 1-2 years before heading to open waters but the majority of American shad head directly to the sea. Shad are usually between 5 and 15 cm by the time they leave the river and by the end of their first year will be, on average, 8 cm long. Males will add approximately 8 cm each year after that until their 5th year when growth slows down. Females grow more rapidly and will reach 42 cm by their 3rd year as opposed to the males’ average of 24 cm. Females’ growth rates level off after this but they will still be, on average, 6 cm longer than males by the time they reach the maximum age of 7. A unique group of American shad is found in Millerton Lake near Fresno where the population is entirely land-locked. Mature shad appear in the San Joaquin River in late April and spawning peaks in mid June through July but can continue as late as September. Millerton shad prefer to spawn in slower water (20-60 cm/s) and will mate only between the hours of 9 pm and 7 am. Millerton shad growth is also slightly slower for females making the rates of growth between the sexes more equal.